Leasing Available from $10.60 per month! For starters, the B512dn delivers up to 47 ppm, with the first page printing in as little as 4.5 seconds.1 It produces black & white output that's clear and crisp at up to 1200 x 1200 dpi resolution, using a two-piece consumables system for long-lasting performance and a low cost of operation. The B512dn features a fast 667 MHz processor, as well as 3 GB of memory2. It has a 630-sheet standard paper capacity (530-sheet main paper tray + 100-sheet multi-purpose tray) and can be outfitted with an optional 530-sheet 2nd paper tray, giving them a maximum capacity of 1,160 sheets- for longer uninterrupted productivity. Fit for any work environment - With its compact size, the B512dn fits just about any work space. It has USB 2.0 and 1 GB Ethernet interfaces standard, and a WiFi option (802.11 a/b/g/n). The B512dn supports cloud/mobile solutions such as Google Cloud Print -, AirPrint - for Apple iOS and OKI Mobile Print app for Android devices. Cost-efficient LED printing - The B512dn employs LED printing technology pioneered by OKI over 20 years ago- and is still innovative today. OKI LED printheads have no moving parts, making them ultra-reliable. 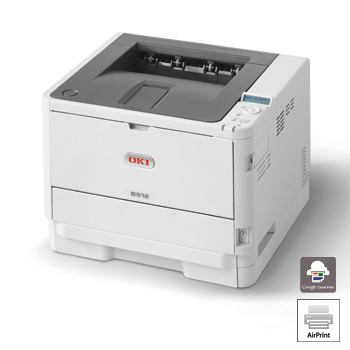 OKI printers are compact, environmentally friendly, energy efficient, and use significantly less raw materials in the manufacturing process. The B512dn comes with duplex (2-sided) printing standard, leading to fewer user interventions and savings on media costs. Its Deep Sleep mode- which reduces energy consumption to less than 1.5 watts- and Auto Power Off feature- which shuts off the printer after a long period of no activity- have earned the B512dn an ENERGY STAR rating. If you need technical assistance, you can speak to a live expert located in North America by calling 800.OKI.DATA (800.654.3282).3 That's 24/7/365.